Welcome to issue 186. This month I was invited to the official launch party for Dodger at The House of St Barnabas in Central London. It was a huge amount of fun with many people dressed in Victorian costume. Terry, Rob, Terry's daughter Rhianna and Linsey Dalladay arrived in style in a horse drawn carriage featuring Terry's own livery. Guests at the party included Sir David Jason and actor Michael Fenton Stevens who has recently been busy recording the audiobook versions of The Science of Discworld. One of the best parts of the evening was Terry's speech where he stated that "writing keeps me going". On the launch day of Dodger the official TerryPratchett.co.uk website disappeared from the web for most of the day. The administrators think it might have been stolen by a young urchin going by the name of Dodger! They have since got the site back and are posting a couple of peelers to keep an eye out for Dodger. The Discworld Monthly Facebook page has really started to get busy of late. We currently have around 2,500 members on the page. Some of the recent discussions revolve around the old classic of who to cast for roles in Discworld movies - inspired in part by the Narrativia news last month. PJSMPrints.com are now taking pre-orders for A Blink Of The Screen - Collected Shorter Writings. The new books will feature a collection of shorter fiction spanning the whole of Terry's writing career from schooldays to Discworld and the present day. The copies from PJSM prints will be signed by Terry Pratchett. The book will be published on October 11th 2012 and will cost 25 GBP. Please note: Once published Terry has to sign the books. Therefore they will not be posted on publication day. Over 1,000 Discworld fans turned up to Ely Cathedral on Monday 17th September to hear Terry talk about his latest novel Dodger. Rebecca Harris, the event's organiser said: "We sold 1,300 tickets for Terry's visit which made it a sell-out. 300 of those were sold on the actual day the tickets went on sale." Work commitments meant I was not able to attend but I spoke with some friends who made it to the event and they all said that it was a very entertaining evening. In the 21st September edition: Top 50 for 9th - 15th Sept. Dodger is a new entry at number 6 having sold 23,003 copies at an average selling price of 10 GBP (for 18.99 GBP). The 5 titles above it are: the three Fifty Shades books at 1-3, The Hairy Dieters at 4, and Bared to you (another romance) at no. 5. Dodger did get to no. 1 in the Children's list for w/e 15th Sept. though, beating The Hunger Games trilogy at 2-4. Opposite the Top 50 on page 16 is a commentary on page 17 mentioning Dodger's instant success with a picture of the cover. In the 28th September edition: In the Top 50 for 16th - 22nd Sept. Dodger has moved down to no. 11 in the list with 15,522 copies sold that week and a total of 38,525 sold so far. It's now no. 2 in the children's Top 10, with Ratburger by David Walliams at no. 1. Tickets for The Studio Theatre Club's production of "Dodger" go on sale on 22nd October. Based on previous productions expect them to sell out quite fast. An update on the Wadfest forum from Rob Lupine. Some of you may have noticed an absence of forum on the Wadfest site recently. There are a few reasons for this. The main reason is that Waddy found a red button in the forum programming software that was labelled, "Do not press this button under any circumstances!" and - well you know the rest. However we have decided to take this opportunity to launch a brand sparkly new forum in its place as part of the big Wadfest reboot! When you register to this forum you'll notice some changes right away. We hope you'll find it a more relaxed, less formal format. You'll be able to contribute to community discussions round the virtual campfire, keep up to date with the latest Wadfest announcements and trade or swap memorabilia on our trading post. There is even an exclusive section for ticket holders, where they can plot and plan activities for the big weekend! Terry recently awarded Dr Chris Medway a research scientist the Sir Terry Pratchett Fellowship, an honour handed out once every three years by Alzheimer's Research UK. The Fellowship, worth over 130,000 GBP, will allow Dr Medway to search for rare genetic changes that may increase the risk of Alzheimer's disease. 13th September: Dodger is published today. It's really rather good. 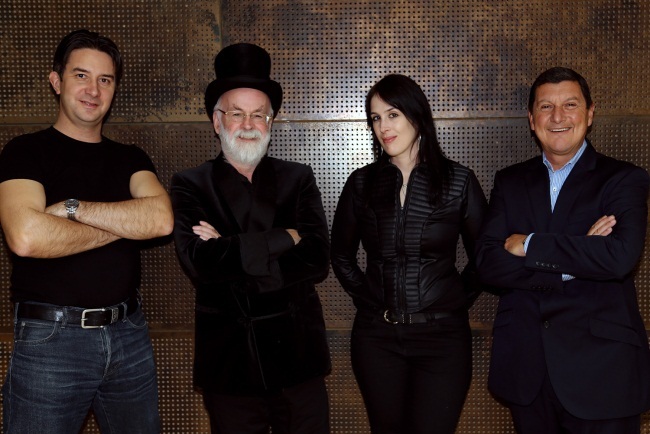 17th September: (Retweet) BREAKING NEWS: Sir Terry Pratchett to be in NYC and Chicago mid-October, celebrating DODGER! Stay tuned for glorious details! Graeme Sheridan and Rhys Parton will be celebrating The Pratchett Podcast's first birthday this month with the twelfth podcast. They plan to review Terry's first novel The Carpet People. At about 5 to 9 a.m. the presenters announced SIR TERRY PRATCHETT, and I grabbed my biro. In he came, and they remarked that he was the first guest they'd had in a top hat. Why choose this theme? Dodger is more or less for young adults, but fans will want to read it anyway. Terry went on to describe the plot, Dodger's "job" and his interaction with Dickens. He said It was a lot of fun to write, and he had got a stove-pipe hat to go with it. Being asked about his health, he said it wasn't too bad at the moment, and he was also suffering with the usual ailments of a man over 60. He really enjoyed dictating his books to the computer instead of typing them. He was working on two books at the moment, and he'd still got his "will to write" . This was the middle episode in a week-long celebration of the Brothers Grimm to mark the 200th anniversary of the first publication of their Fairy Tales. Other guests included Philip Pullman, who is publishing his new reworking of some of the tales, and Michael Morpurgo, who both praised the work of the Brothers. Terry spoke of his love of the stories, which he probably came across at school, and because everyone knows them, "someone like me can play a lot of tunes on them". He spoke of The Amazing Maurice, a version of the Pied Piper, and of how many fairy tales probably arose as prohibitions and good advice, usually to young girls. He was aware of the violence in the original tales, but would not cut corners when writing for children: "You can take the kids through the dark wood provided you get them out the other side". Then we had a reading from the Sleeping Beauty episode in Witches Abroad, and ended with some music: Tchaikovsky's Sleeping Beauty waltz. During the Discworld Convention in August Terry was interviewed by the Telegraph newspaper. The headline for the interview was: "I thought my Alzheimer's would be a lot worse than this by now". Writer and broadcaster Brian Sibley recently posted on his blog about the release of Dodger. Interestingly he includes an unedited audio interview he recorded with Terry back in November 1995 for BBC World Service to coincide with the release of Maskerade. The Page Turn features an introduction to Dodger written by Terry. The site also features a video of Terry talking about Dodger. [AU, New] The Last Hero, adapted for stage by Ian Rennie, is being performed at Brisbane Arts Theatre in September and October. Unless otherwise stated the Drummers meet on the first Monday of each month. In October this will be Monday 1st. The next meeting is Friday 5th October. [AU, New] Games night in Sydney, Australia! Games: Ankh Morpork and Guards Guards. Selection by popular demand on the night. 7pm for a 7.30pm start. Friday the 12th of October in Ashfield, Sydney. Contact for details. [US, New] Terry will be visiting Andersons Bookshop, 123 W. Jefferson Avenue, Naperville, IL 60540 on Tuesday 16th October to talk about Dodger. Tickets are available with the purchase of the new book from Anderson's Bookshop. Tickets required. [UK] Scunthorpe Little Theatre Club will be performing Guards, Guards at The Plowright Theatre, Scunthorpe from Wednesday 17th October to Saturday 20th October at 7:30pm. [UK,] The Cult Classic Theatre in Glasgow, Scotland has recently been given permission to adapt Good Omens for the stage and the show will take place in March 2013. Phil Harris writes: I have been dragooned into selling off my daughter's old Commodore 64 gear. One of the items is the game "The Colour of Magic" by Piranha. I just wondered if this item would be of any interest to Discworld fans. It is in the original box complete with the wraparound. It says CBM64/128 on the bottom, whatever that means. I'd like Pratchett fans to have first dibs at it. If nobody is interested then I'll stick it on eBay along with The Hobbit. We assume any correspondence is eligible for use in the newsletter unless otherwise stated, including the sender's email address. We may also edit your letters while trying to work out what happened to September..
Is this a case of life imitating...The Long Earth? Funny how differently people react to the same thing! Like William Barnett, I too noticed that Terry has developed a new style in parts of 'Dodger', writing 'sentences with asides in them that make them longer and more circuitous'. But I thought this was very effective at rendering the rapid flow of Dodger's thoughts as he chews over this or that problem -- a form of 'interior monologue', which is a perfectly acceptable novelistic technique. And if Terry decides to bring out a new gadget from his writer's tool-box, I for one will not complain. My wife lost her grandfather to Alzheimer's a few years ago and since then she has been looking for a way to do something in his name that would help other people suffering from similar conditions. To that end Team Tigerbalm (My wife, myself, & some friends) are taking part in the Longmynd Hike, a 50 Mile hike summiting 8 peaks all in the space of 24 hrs (aiming for sub 20). We are raising money for a Charity called Daybreak http://www.daybreak-oxford.org.uk/ which is a day club for people who suffer from dementia. Not only do they offer an important service to the dementia sufferers but it also gives their home carers time to themselves to do "real world" things that they most likely would not be able to get done if they had to care 24/7. DWM replies: I'll be right back - feeling hungry now! When I heard about the Dodger Trailer on You Tube, I went and looked for it immediately, and wow, want more now!!!! They really have to make the movie of this with that cast and scene, really they do... It would be great. I'm looking forward to 'Dodger', the book, I'm sure it will be better than 'The Long Earth', which I may say is the first Pratchett book I have not enjoyed. Its hard to read, boring, and just doesn't seem to be going anywhere. Sad to say, I have just finished Snuff. It was pure joy, and I am sad because it is over, and I have to put it on the shelf for a month or two to come back fresh (one of the advantages of age is the failing memory, so books re-read many times). I had found Unseen Academicals a little disappointing, so it was good to see Terry back on top form. I am sorry to say that The Long Earth was not so satisfactory. I know Terry is down as first author, but there was little sign of his wry wit and wisdom here. My hope is that, like The Colour of Magic, it is to be the first in a series, which will get better as it goes. WB replies: many, many people would agree that the Discworld series has got better as it's gone on, John... but I laughed more at those first two books than I ever have at any of the great books that have come after them. This month I've got five questions from The Truth for you to rack your brains over. Some easy, some quite hard. Well at least I think they are hard. When William de Worde is hit by the press, what letter makes the biggest impression on him? What is the world's rarest and most evil-smelling vegetable? Who did Mr Tulip become when he put on a religious disguise? What was the most active ingredient in William's scent bomb? What did Mr Tulip reincarnate as? In DWM#184 there was an announcement for a theatre play of Carpe Jugulum after the book by Sir Terry Pratchett. Finally a theatre play in Germany! I've been scanning the announcements in DWM for years and longing for a performance somewhere locally. And local it was, Hanau is only 40 km away from where I live. I wouldn't have missed this under any circumstances! I did a bit of searching beforehand to find out about the actors, and the web search brought up a theatre group but I was astonished to find them "Die Dramateure" located in Zurich, Switzerland. Since their agenda did not include Hanau I assumed there's another group not yet appearing with their own web site, thusly not known by search engines. And yes, "Die Dramateure" is also the name for a group of students of the "Hohe Landesschule" in Hanau. (The contents of the page seem a little bit outdated but I include it anyway for your curiosity). Since it was a school play most of the audience were parents and other relatives of the actors, plus perhaps some teachers. I admit I didn't investigate if any other visitors dropped in after reading the DWM announcement. And now for something completely different: let's talk about the play! In one short sentence: it was absolutely great, and I loved it as much as my children (9 and 12). My 12-year old daughter just started reading Pratchett (I suggested to start with "Nation", in german "Eine Insel"), and she already knew some Discworld details from me. My 9-year old son didn't know anything about Discworld, but knows everything about vampires ... or vampyres which is more modern ;). They enjoyed the play as much as I. If you're a keen Pratchett reader like me you know that the story basically takes place at two locations: King Verence's castle in Lancre where the baptism of the royal baby is about to be celebrated, and the d'Elstyr's (Magpyr's) castle in Uberwald, where the final showdown happens between the witches and the vampyres. I was at a loss a little bit because I only read the english books since "Pyramids", and so I realized quite late that most names are translated in the german books. For example the Omnian priest (Quite Reverend Oats) is "Machtig Himmelsang" in the play (which translates back to something like "mighty song of the heavens"). The stage had a very minimalistic setup, but the actors made it appear like the real castles in our imagination. Nanny Ogg was the most present actor on the stage, followed by the narrator who introduced the audience to the Discworld and also gave some explanations throughout the play (he also played Verence sometimes ...). My son and I liked the Igor most who did a wonderful job of crouching and lurching, and saying things like "the old mathter wath a real gentleman" (of course he lisped in german). The next best was Igor's dog Thcrapth ("Fetzen"). Although Granny Weatherwax is by definition the most present witch ever she was a bit underrepresented in the play and her voice and appearance could have used a bit more power. Oats did a very good job of showing his doubt about knowledge and belief and the final fighting scene between him and the count was graciously "[censored]" by a huge poster carried by two stage helpers. Agnes and her second self Perdita were played by two nice young girls dressed alike and Perdita was a wonderful inner voice to Agnes. There were some fine-grained local adaptations which were well accepted by the audience, notably the bridge guard spoke a sort of hessian-turkish lingo which was very funny, and the Magpyr castle dungeons were called "hola dungeons" (hola being the abbreviation for the Hohe Landesschule). In general I recommend the theatre group of this school and I hope that they will come up with another Pratchett play in the future. I have little hope though because some of the actors were in their finals or even had left the school but returned for the play. Kudos for that! The audience gave long and well-earned applause and standing ovations. The website is a bit old-fashioned and promises to get updated real soon. In the lobby were ads for other theatre plays like Shakespeare's "Sturm" but I cannot tell how you could access the agenda unless you have personal connections to the school. Last month the very lovely Sandra Kidby of http://www.discworld.com donated a wonderful signed, stamped and hologrammed first edition of Dodger for us to give away. The answers we were looking for were 20 GBP and 1,241.26 GBP respectively. I'd like to apologise now for mistyping the email address last month. I missed an 'm' out of it and a number of messages bounced. We corrected the website issue and put a notice on the news section to let people know so hopefully you managed to get through. Even with my mistake we still received over 100 entries into the competition. The randomly selected winner is Sara Boorman of Gosport, Hants. I've passed on your details to PJSMPrints.com who will dispatch your prize to you directly.. This is a complementary review to Jason's in DWM 185, as we sometimes attended different events. My first reaction was awe at the amount of work the Committee had put in to ensure that whatever your taste, you would have a range of activities to enjoy, as not everyone wants to follow the lecture "stream" though that was my preferred route. Most notably the long-established Guilds had been replaced, this time, by Sects, which organised group activities in honour of their deity and built up to Monday's conclusion: Bye Bye Bel-Shamharoth! This was all part of the conference theme. Since this was the 7th plus 1 conference, the Committee decided that we would celebrate the early days of Discworld, especially the first two books The Colour of Magic and The Light Fantastic, and so the brochure cover featured Twoflower. I also went to the Guest of Honour Interview, as most of us did, and would like to add to Jason's report the news that Terry and Rob had visited the orangutan sanctuary in Borneo, filmed for a TV documentary later this year. We saw several of Rob's photos of the tour. On Sunday morning the traditional Church of Om was replaced by "That would be an ecumenical matter" but was still led by the usual suspects. This was part of the live role-play as representatives of each Sect appeared and devised a curse on the wizards for causing the impending catastrophe of the Star (see The Light Fantastic). Then I went to Stephen Baxter's lecture which recalled that same book as he showed how Terry had followed the pattern of cosmic threat established by H G. Wells and by disaster movies such as When Worlds Collide. Such stories move through periods of mild threat, serious threat, panic, climax and relatively peaceful aftermath. Baxter illustrated his lecture with movie posters and book-jackets, including one of his own! Straight after that came the Ian and Jack show, as Discworld's two resident scientists announced that Science of Discworld IV was on its way. Consulting with Terry, they had finally got the story straight. It will be extremely up-to-date with today's news, but I have decided not to give away the plot and spoil the surprise: however so far it's looking very good. Next day I was one of many in the Dysk to applaud the Reduced Discworld Company in Eric, a book unlike all its predecessors, being a large-format near-graphic novel designed to showcase Josh Kirby's talents - and to return Rincewind from the Dungeon Dimensions. This also suited the conference theme, being about Rincewind, his inept companion, and the Luggage. As it is unlikely to reach the amateur stage, we were really lucky to see this production, directed by the very talented John Hicks (Dr. Hix). The twelve actors played either one leading role, or several supporting roles, and I'll just name Tim Williams as Rincewind, Andrew Nevill as Eric, Tony Perkins as Astfgl (King of the demons), Richard Atha-Nicholls as Death and Lavaeolus, and Jacqui Lawrence as the Parrot. As well as their well-honed talents, one must admire their dedication in missing so much of the Convention to rehearse the play, and also compliment the crew, props, make-up and wardrobe team. So on to the Closing Ceremony, the awards, the farewells, and the new Chairman, Dr. Hix, was announced and a commitment made for 2014. There are several Pratchett books planned for late 2012 and 2013, and all attendees received a luxury brochure containing Colin Smythe's review of the last 2 years, articles by Jacqueline Simpson, Ian Stewart, Stephen Briggs and Stephen Baxter, and an account of the Orangutan Foundation, of which Sir Terry is a trustee. Moreover, if you can't wait two years for your next Discworld Convention, there are several 2013 conventions being organised by fans in other countries! Sir Terry Pratchett said, "This is an exciting and natural development for me and my works, and I look forward to working closely with the team to develop new stories in areas other than just print and ebooks and, of course, seeing my first Big Screen project come to fruition." Rod Brown said, "This is a dream challenge for me! Having worked very happily with Terry, Rob and Rhianna over the past decade on the three mini series for Sky 1, I have grown to love the world and characters Terry has created so when Terry invited me to head up the company for him, it was easy to say yes... please!"